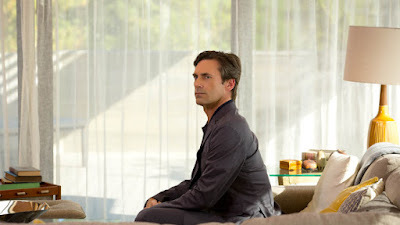 I liked the ideas in MARJORIE PRIME far more than the film itself. The ideas surround the nature of memory and AI. In a near future, AI has developed to the point that grieving people can buy a "prime" - a lifelike robot who can learn to remember your family memories. As the film opens, we have an old lady called Marjorie (Lois Smith) who interacts with a younger avatar of her dead husband (Jon Hamm). What's fascinating is that she is teaching him their shared memories but chooses to alter some of them - making his proposal more romantic so that that becomes his version of events. And then, as her memory fades and he becomes her factual record, it's the fake memory that becomes the shared history. Marjorie's daughter (Geena Davis) is initially horrified by the concept of her mother having a relationship with a Prime, while her husband (Tim Robbins) sees it as a boon. But as the film develops, we see the two of them have their own relationships with Primes and the position shifts as they too start to re-interpret history through shared but altered memories. Most impressively, in the final scene of the film, we see the Primes themselves interact and share those memories, moving further away from the truth. The film, then, raises important and nuanced questions about the nature of shared memory and the ethics of altering it. Should the truth be privileged or is it better to tell white lies that comfort people? The problem with the film is that it reads like a didactic treatise rather than a living and breathing drama. Matters aren't helped by the fact that director Michael Almereyda largely keeps the action in the closed confines of the family home, paces the film slowly, and does little with his camera. To that end, the movie feels like a filmed stage play, and it is indeed based on a play by Jordan Harrison. I found myself admiring its ideas and some of its performances but deeply deeply bored. MARJORIE PRIME has a running time of 98 minutes and is not yet rated and does not yet have a commercial release date. It played Berlin, Sundance and San Francisco.